Interested in achieving great results in the subjects you love? Interested in studying in English? Interested in admission and scholarship to the university of your dreams? We offer over 100 online courses in a broad spectrum of subjects in English, from math to creative writing. You can start at 11 years of age and study until high school graduation. 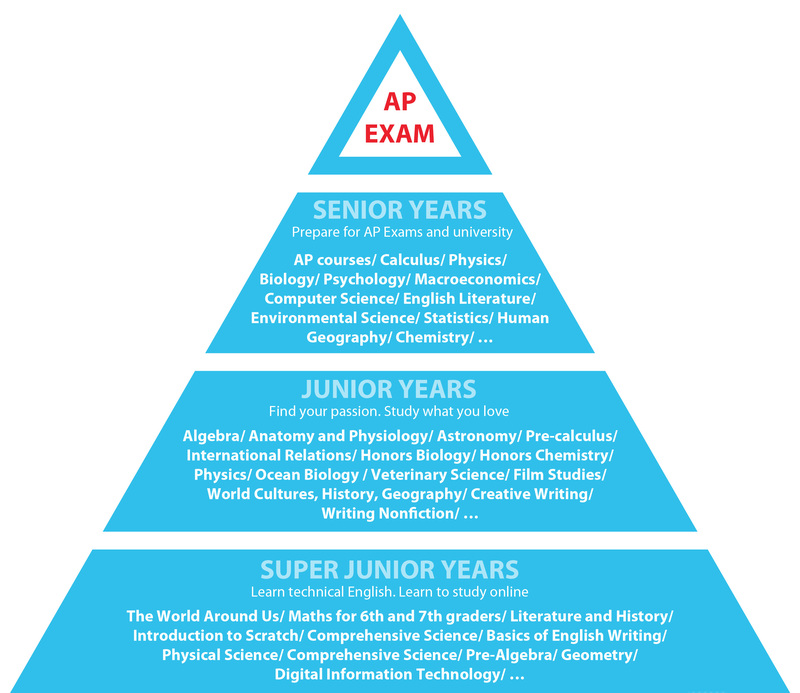 You could start with introductory courses (3-6 months long) and advance to demanding Advanced Placement (AP) courses (7-12 months long) in order to prepare for international AP exams, which are recognized for university admission at home and abroad. Show interest in the subjects you love and gain “substantive bullets” for your CV. Courses for younger students take about 2-3 hours a week. AP courses may take about 10 hours of studying a week. There is no point in hiding anything: these are demanding courses. The only thing we can promise is that you will never be sorry about the time you invested in your studies with CTM Online. Courses commence during the first week of October and end according to the length of the course. One-semester courses close at the end of January. AP courses end in April. Other two-semester courses close at the end of May. Registration is open from October 22 to November 18. Courses commence during the first week of December and close at the end of June. Students receive detailed schedules from their instructors. The Czech Ministry of Education provides scholarships of Kc 5,000 each to the 200 students who register first. We offer scholarships and seek other sources of support from private sponsors to improve access for deserving students to CTM Online. "I liked the readings about practical cases (like It's all Greek to me). It gave me a nice insight. I would like to study medicine in the future, and if I weren't sure before, thanks to the course I am now." I would like to thank you for the opportunity to try CTM Online courses and the CTM Completion certificates. I could very much recommend these courses. Working with my instructor went very well, she was prompt in answering all my questions. Overall, I very much appreciate this opportunity that was made available to me. "I am writing to thank you for an amazing experience I was able to get this summer thanks to CTM and AFCSLS, who funded my stay." "I enjoyed this course. Sometimes, it was tough to fit all of the assignments in between my school work and other activities, but Iím kind of proud of myself, that I made it. There were days, when I wanted to do it, study and then do the assignments, but some days were also hard, when this course was the last thing I wanted to do. I liked the teaching method, they used, when they were making the course." "Not only did I learn a lot from this course, it was also done in its own fun way. It‘s done in a very interactive way and there are many interesting facts about the lesson topic added outside of the study material." The course helped me to enrich my English vocabulary in subjects taught in our school only in Czech. When I decided to take AP Chemistry last school year, I did it because I like the subject, especially the opportunity to engage in various lab experiments. This year I am graduating. Reflecting on the AP Chemistry, I think it was one of the best decisions I have made so far. “Despite all the difficulties in your efforts to establish CTY in the Czech Republic, I would like to express my gratitude for what you do for talented children. Today, my daughter received a CEA certificate, most likely due to taking CTYOnline courses. I am sure relying only on school would not have been enough. I wish you all the strength to overcome adversity of the education establishment." It was a real pleasure to work with my instructor, and I improved my math skills. Also I learnt what it was like to work in a time stress and under pressure. Today I am able to say with a calm heart that study with CTY Online and everything which the program prepared for me, every experiences will certainly help me in my future life. I enjoyed it very much. I do not deny that sometimes there were the days when I wanted to stop.